A fellow “baby boomer” commented to me recently, “I guess we’ve all abandoned our dreams by now.” I immediately reacted by saying, “Speak for yourself.” I for one can’t imagine abandoning my dreams. Am I odd in that regard? Am I naïve? Am I different from my generation in that I’m still an optimistic dreamer? Or was the fellow who made the remark the odd one? I’m not quite sure if my hopeful outlook has to do with who I am, or is a trait of my culture as an American or I’m the product of the generation I grew up in? I suppose my hope stems from all of the above. I read an article in the May 20th edition of Time Magazine, entitled the ME ME ME generation – the Millennials. Part of the article talked about basic broad stroke traits of other generations. Generally I don’t like broad stroke summations of a culture or a generation but nevertheless I found some of the descriptions to be pretty much on target. As far as being “hopeful” the Millennials are more in kin to the Baby Boomers, and tend to believe in themselves and the power of realizing their dreams. They seem to be more interested in what they can do and on a global scale than Generation X, which came before them. Sadly, Generation X came up at time when “greed was good”, “heroin chic” was a style in vogue and ennui ruled the day. Those are pretty broad strokes for sure, but I think the over riding thread that seems to define a generation is whether they tend to be hopeful or not. I find that I always need to be creating something. It’s what gets me up in the morning. It’s what gives me hope. It’s also what every single person possessed who took part in our film project. They all believed that they were doing whatever was in their power to do and that gave them hope. Of course the key is in the doing and that is why I love to create. Think about it. You can either give yourself reasons NOT to do something or you can give yourself reasons TO do something. Giving yourself reasons not to do something may seem like it empowers you but it actually leaves you powerless. It puts your destiny in everyone else’s hands. That rarely yields hope. 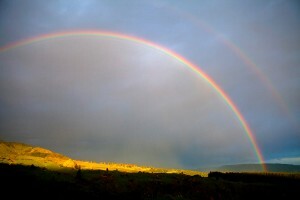 The act of doing something, on the other hand, creates possibility. The universe holds possibility for anything and everything to happen – we just need to put things into motion to allow them to happen. Nine out of ten things might not work out but that doesn’t mean they didn’t play a part in the process. It doesn’t mean they didn’t have value. Perhaps the value will be realized later on. These past few days have probably been some of the most “eye opening” days for me personally throughout our entire trip. We’ve been visiting Captain Paul Moulds and the Oasis Youth Support Network – a network of people and services that help the thousands of young people living on Sydney’s streets each night. Unfortunately, homelessness is a real problem in Australia and its cities, as it is in many major cities all over the world. Over 32,000 people under the age of 25 are homeless every night and the numbers are only growing. Luckily, there are wonderful people like Captain Moulds and many others at Oasis who have dedicated their lives to helping these young people, giving them a chance at changing their lives by just being there for them and listening, as my mom elaborated on previously. And while I have certainly been inspired by Paul and his Oasis colleagues, what has impacted me the most has been talking with the kids. In the past few days, I have gotten to meet several of them and hear their stories – one heartbreaking story after another. Pasts full of abandonment, sexual abuse, drugs, prostitution, sleeping on the streets, being forced to steal food to survive. I watched a young man cry, as he explained how he didn’t have a home because his mom had chosen prostitution over him. I sat and listened to another person describe the numerous ways he has tried to kill himself, without even blinking an eye. One girl showed me her enormous scar running down her back where she had been stabbed while trying to stop a street fight. As horrific as these stories are, what has really affected me is the fact that these people are my peers – many of them are the same age as me. And yet they have already experienced so much pain and neglect, more than I can even imagine. They dream of just having one person they can count on, knowing that there’s someone who cares about them – something I definitely have taken for granted. This experience has certainly made me reflect on my life and the things that I am very fortunate to have. Two parents who have given me the moon and the stars, and who have supported me in every way. Friends and loved ones who I know I can trust and count on in any situation. A bed to sleep in every night. An education and options for employment. The freedom to choose my own life path. It’s so important to remember that there are many people who don’t have any of these things and don’t believe that they ever will. I’m happy that say that there is certainly hope for alleviating youth homelessness here in Sydney, thanks to people like Paul who actually do acknowledge and care about the issue. Having that human connection, a person to trust, a person who will listen and be there for you – that certainly is the key, and I’ve seen the results firsthand. I’ve heard many of the kids say that if it weren’t for Paul and the people at Oasis, who listened to their stories and helped them get through each day as they worked through their problems, they would be dead right now. Instead, they’ve started new lives – going to school, getting a job, pursuing a musical career, educating others on the problems of youth homelessness. In fact, we attended an event tonight that was put on by a young guy who went through several Oasis programs, and who recently started his own entertainment business – six months ago he was homeless, with no hopes or dreams in sight. It’s quite amazing to see the power of the human connection and how knowing that someone cares about you can make all the difference in the world. 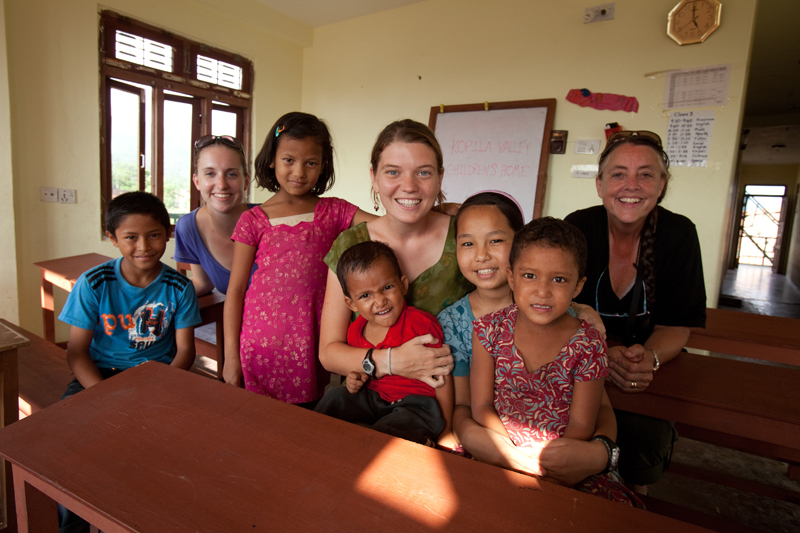 We are visiting Maggie Doyne and her 30 children in Surkhet, Nepal. Maggie and Erin went to high school together in Mendham, NJ, an affluent, homogenous town in the pretty part of New Jersey, with rolling hills and an abundance of beautiful open space. It’s kind of like a little idyllic bubble and a great place to grow up. 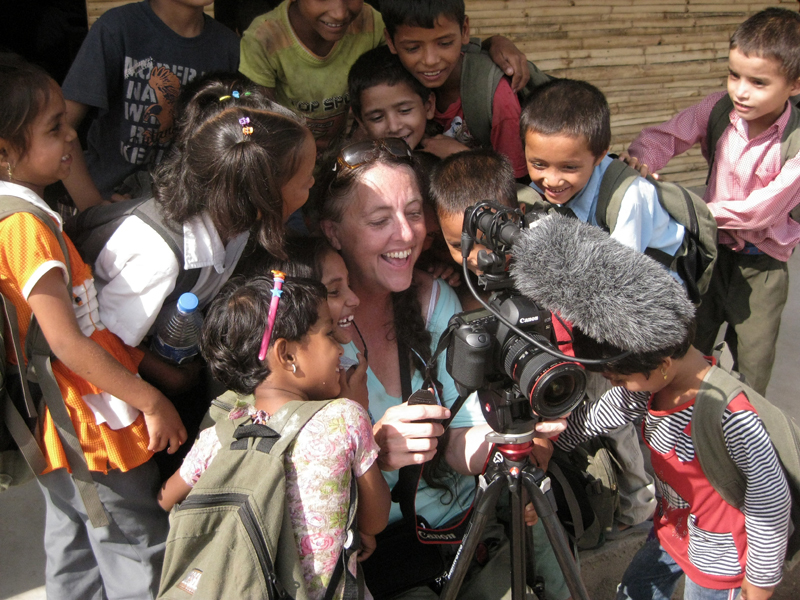 Maggie is a world away from Mendham, but has created a very special bubble in Nepal. After graduating from high school she opted to take a gap year instead of heading straight to college. She traveled a bit and then volunteered in an orphanage in India. It was there she became aware of the orphaned Nepalese children displaced by civil war. She knew in her heart that she needed to do something for them and she did with her Blink Now Foundation. That was about 5 years ago. She’s now 23 years old and has built a home for 30 children and is currently in the process of constructing a school. Not just any school or a one room type of affair, but a school that stretches out into 2 wings and an eating and communal hall where all the children can gather for performances and other events. There are four classrooms already in use and she has had to turn many local children away who wanted to attend school in this special place and recognized the importance of an education. We’ve been with Maggie now for about 5 days and she never seems to stop. When she’s not overseeing the construction projects, she’s teaching, running errands in town, doing laundry at the local spring and attending to the children. Not just her 30 children that live in her home but the 200 plus children that attend her school. In the evenings all the children in her home gather around for prayer and song – the family meeting. The children run in age from 2 to 13 years old and it has been a joy to be with them. Their background stories are sad and difficult to hear, but to see them now, so happy and compassionate for one another is a testament to Maggie’s love. Maggie is full of love and is passionate in her desire to see that children get the joy and happiness out of childhood that she had growing up. These children don’t have the toys and games and fancy clothes that many children in the US have. Some days there isn’t running water or electricity making it even more difficult. The children come down with illnesses that simply don’t exist anymore in America but Maggie has given them a life of hope. She’s making sure they get an abundance of love, the food and clothing they need and a good education. Not the education that exists in the Nepalese government schools, that are based on rote recitation and frequent beatings when a child does something wrong, but a good education and with that a lifetime love of learning. Each day I’m here, I’m more amazed at what Maggie has achieved and to think she is just 23 years old. She has an amazing spirit and has transformed this community. She travels back to the US a couple times of year to speak to others about what they can do to make a positive difference in the world and in the process has inspired others to realize their dreams. 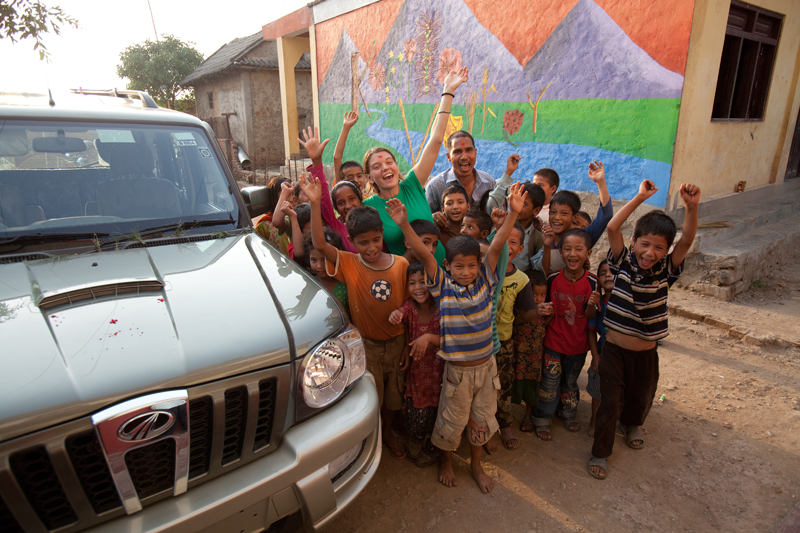 Today’s a good day because today Maggie and the kids get a car. Up until now, she needed to either walk or ride her scooter into town to get supplies or take a sick child to the doctor or hospital. I can’t wait to see the excitement in the kids’ faces when she drives up to the house. And as soon as I’m able to upload photos – I will. Life is a bit slower here and along with that the Internet. But I’m not complaining – I feel blessed and at peace after spending time with Maggie and her kids. Like Maggie says – “things happen for a reason” and “things happen when they’re meant to happen”. And today was the day they were meant to get their new car.